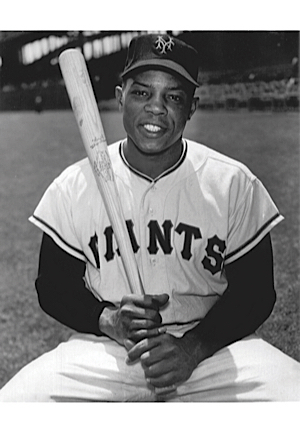 Arguably the best outfielder to ever play Major League Baseball, Willie Mays was inducted into the National Baseball Hall of Fame on the first ballot in 1979. Mays was a 24-time All-Star, a World Series champion, a two-time National League MVP and led the National League in home runs four times. In addition to his offense, Mays dazzled with the glove, winning 12 Gold Glove Awards while making some legacy-defining catches throughout his career. Mays played on one of the most successful National League franchises before their fateful move to San Francisco. The Giants home stadium was located in Upper Manhattan in New York City at the Polo Grounds, where all-time rivalries with the New York Yankees and Brooklyn Dodgers created some of the all-time historic baseball moments. 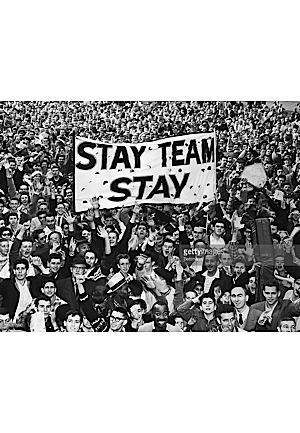 With the Polo Grounds in poor shape, the 1957 season would be the last for the New York Giants, who relocated to San Francisco. 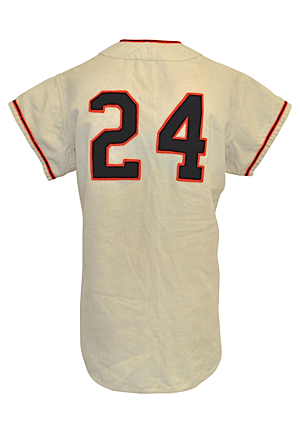 When he wore this jersey during his final season as a New York Giant, Mays was named an All-Star, won a Gold Glove Award and led the National League in triples, stolen bases and slugging percentage. 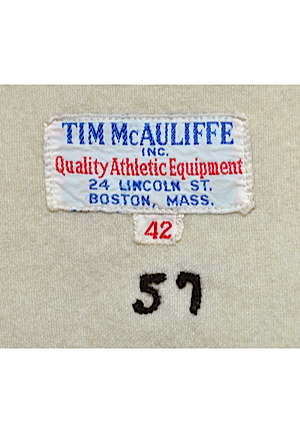 On the front left tail is a “TIM McAULIFFE INC.” manufacturer’s tag with a size “42” flag tag attached below. 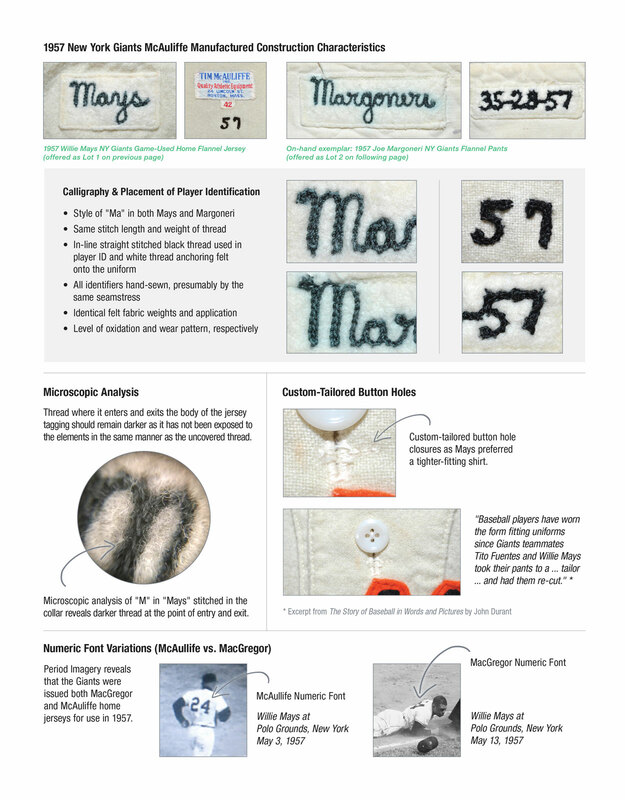 Below, the number “57” is embroidered directly onto the jersey in black stitching. Located inside on the rear collar fold is a felt tag with the player name, “Mays” embroidered in black chain-stitching. 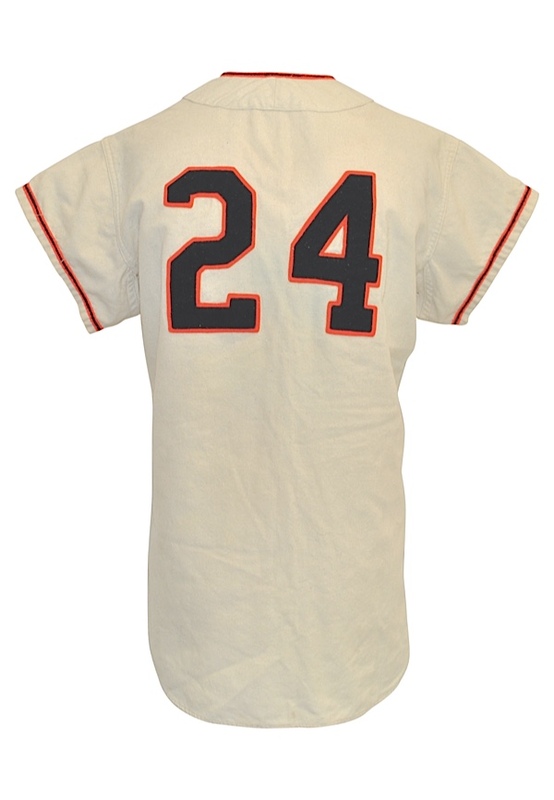 Across the chest reads, “GIANTS” and the player number “24” appears on the back. These are done in black on orange felt sewn directly onto the cream-colored flannel jersey. 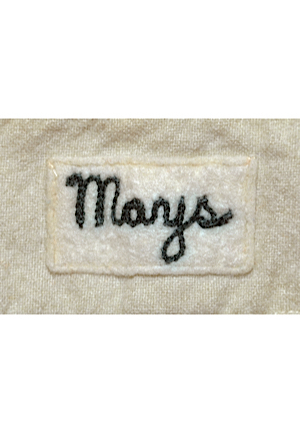 The sleeves are fashioned in a “set–in” style and cut to a mid bicep length of 1 ½”, a preferred Mays trait as confirmed by period images. The collar and sleeve ends are trimmed in ¼” black and orange piping. Custom tailored buttonholes as Mays preferred his shirts tight. The shirt is tagged size 42 and measures out slightly larger. 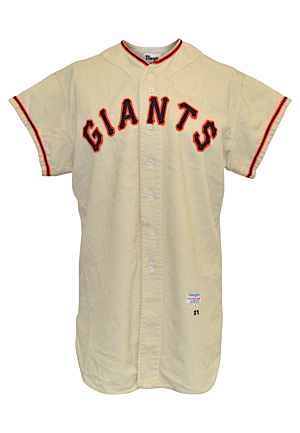 This jersey is in fantastic all-original condition and has single owner provenance that is directly sourced from the New York Giants in the 1950s. This jersey is properly tagged, was presented to us as game-used and in our opinion, shows excellent use. Accompanied by an LOA from our consignor stating, "In the late 50s I was working as a buyer for Bon Marché department stores in Tacoma Wa. Cheney Stadium was about to have its grand opening, which was to be the future home for the farm team for the Giants. Our store was approached by the team to have some of our personnel wear Giants uniforms in the store to generate press. They sent us a box of old uniforms, which were handed down from the pro level club from a few years prior. I was lucky enough to grab Mays’ jersey and Margoneri matching pants. When we we told that we could keep the uniforms, I immediately knew I had something special and put it away in a drawer for 60+ years." You would be hard pressed to find a finer Mays available in the marketplace today. The jersey dates back to the team’s final season in New York, has single owner provenance directly sourced from the team and there is no doubt that this is a museum-level piece. Auction closed on Thursday, May 26, 2016.